“The Christmas Carol” is a staple musical to see this time of year. However, there are many other holiday-themed musicals for audiences to enjoy. One of those is the classic “White Christmas,” and it is coming to Haddonfield. Straight from Broadway comes “White Christmas” to Haddonfield Plays and Players from Dec. 10 through Dec. 20. The classic holiday musical will play hits by Irving Berlin such as “Blue Skies” and “How Deep is the Ocean?” to leave the audience feeling merry and bright. “It is a story of a friendship and love using a brilliant score by Irving Berlin to tell this classic tale beloved by millions thanks to the movie of the same name. But, also, underneath that is a story about veterans and how one act of kindness can change a person and family forever,” co-director DJ Hedgepath said. “White Christmas” tells the story of two friends and former military veterans in showbiz putting on a show at the Vermont Inn while finding what may be their soul mates. The original Broadway production received two Tony Award nominations in 2009 for Best Choreography and Best Orchestrations. 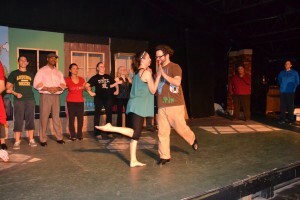 The HPP’s production of “White Christmas” will include lots of dancing, romance and timeless holiday music. “We have taken the grandiose of the Broadway show and made it more minimalistic to focus more on the story and characters,” co-director Darryl Thompson, Jr. said. The idea for having “White Christmas” as the winter show for HPP began in fall 2014 when Hedgepath and Thompson were asked to direct the show. Both loved the movie and were excited with the possibilities they could bring to life on the HPP stage, Thompson said. They, along with a talented cast of 23 and others behind the scenes, worked for three months to get the show together and stage ready. Dancing was tough, but audiences will be blown away with their accomplishments, according to Hedgepath. As they were going through the process of the show, both directors realized this show wasn’t just about holiday music, friendship and romantic love, but about loving and caring for veterans. So they decided to have a performance dedicated to veterans on Dec. 19. With energetic dances, winter classic songs and talented acting, audiences will surely be entertained, from children to senior citizens. 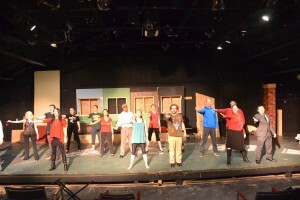 “The audience should expect a night at the theater full of fun, great songs and incredible singing and dancing that the whole family can enjoy,” Hedgepath said. Hedgepath hopes those who attend not only enjoy themselves, but leave with the feeling of the holidays and the season of giving. “White Christmas” will have a preview performance on Thursday, Dec. 10 at 7:30 p.m. and officially open on Friday, Dec. 11 at 8 p.m. Other performances will be Dec. 12, 16, 18 and 19 at 8 p.m. and Dec. 13, 19 and 20 at 2 p.m. The Wednesday, Dec. 16 performance is a midweek special with tickets half off and the Saturday, Dec. 19 matinee is a Veterans Appreciation Performance. Haddonfield Plays and Players teamed with the Haddonfield American Legion Post 38 to dedicate this special Saturday matinee to veterans. Special donations will be accepted and proceeds will be shared with New Jersey Veterans Haven in Winslow. To learn more about this transitional housing program for homeless veterans please visit www.nj.gov/military/vetshaven. To get information and tickets, go to www.haddonfieldplayers. com or call the box office at (856) 429–8139 during office hours. “This is the perfect show for the entire family to come and enjoy together as this is a story about just that — family and friends. 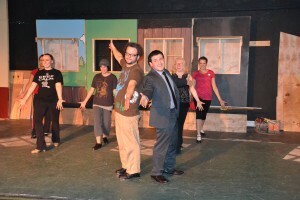 Plus you don’t want to miss these fantastic actors and dancers,” Hedgepath said.